I’ve never been one to think very far into the future. Retirement planning was such a tough concept for me. It’s forever away, why do I need to start planning now? And if you’ve been reading for a while, you know I am also the Crown Princess of Procrastination Nation. A few weeks ago, a friend of mine posted on Facebook and said that volunteers were needed for this year’s South Shore Half Marathon, and people that volunteered would get free registration next year. I’m not sure why I even cared. I mean, I had friends that ran it last year, and it’s super close to my house, and runs through a gorgeous part of the burbs that I live in, but still. Aside from being a habitual non long term plan ahead-er, I haven’t run in… a while. Like two years, give or take. Still, I immediately texted my running/walking/brunching partner, Sara, and told her about my cockamamie plan, signed us up, and wondered how cold it was going to be on race day. (It wound up being high 50s/low 60s. Last year, it was in the 20s, so this was definitely better). We signed up to work at the finish line. I had no idea what we’d be doing, but at least we didn’t have to be there until 8. I probably would have gone for race day registration, because sitting there doing paperwork is my speed, but it was a) bananas early and b) already full. So finish line it was! 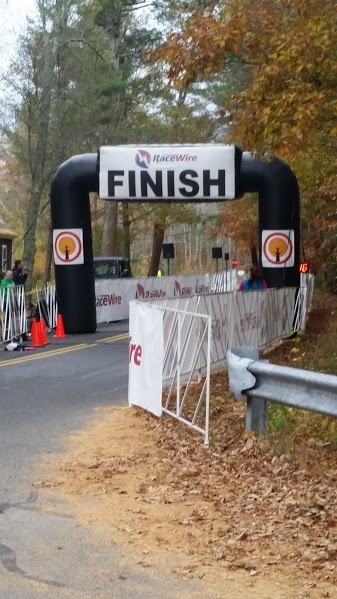 It took us a few minutes to even find the finish line, because it’s tucked away on a side road, behind a cemetery, at the bottom of a hill, almost in the woods. Having not volunteered before, we were a little lost, but Sara and I are take charge, bossy types, so before long, we found our spot and got down to business. We wound up unpacking, unrolling, and eventually, handing out medals. There were a LOT of them. Something like 2200. I had no idea that many people were running this thing. Unpacking isn’t exactly glamorous work, but man, handing out medals to people that just finished a half marathon? That is FUN. We were actually around the corner from the actual finish line, but we could see it through the trees. There was music playing (omg, please stop with the cheerleader song, I cannot), and a generally festive atmosphere. We stood around for a bit, waiting for the first person to cross the finish line (1:15:13, woah) and then more people started to trickle in. And then BOOM, it just sort of exploded for about an hour. With 7 people handing out medals, we could still barely keep up. But it was a good kind of crazy, you know? Some people looked like they were just out for a leisurely stroll, some looked like they wanted to die. One guy proposed to his girlfriend as she finished (she said yes! check out the race’s FB page for pics. ) But they were all pretty happy to see us! (We were directly in front of the bananas, which may have been part of it). I said ‘Congratulations’ and ‘Great job’ so many times. A lot of people thanked us for volunteering, which was cool. Things would slow down and speed up, but it did trickle down eventually, and then we heard someone say there were only a few more people left out there. My partner in crime, Sara, during a moment of downtime. Leaving before everyone finished was in NO WAY an option. 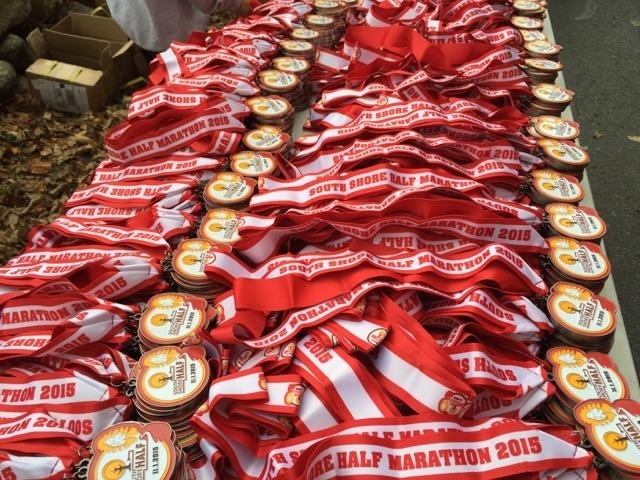 If you finish a half marathon, even you’re the last one to finish… Hell, ESPECIALLY if you are the last one to finish, someone better be there to hand you a metal. All in all, it was a great experience. I feel so motivated, and inspired, by all the people that ran that race. And, that day reminded me of a few things that I needed to be reminded of. I saw so many people with this look on their face, this immense pride at having finished, this visible sense of accomplishment. I want that moment. And the medal that goes with it, tbh. Not everyone who runs half marathons looks the way you might expect people who run half marathons to look. I.e. I won’t be the only fat girl at the party. So, in a year’s time, I plan to be on the other side of that finish line. Sara and I are working out the details of our training plan. I can tell you it won’t be like my last half marathon training plan (pretend you haven’t signed up for 8 months, then try to train in 8 weeks and gift yourself with a year of intense PF pain). And hey, if you’re from this area, and want to join me, do it! Heck, even if you aren’t from anywhere near here (HINT HINT HINT TO MY CHICKS), you should come up anyway. You don’t even have to run. Just volunteer. You can hand me my medal. 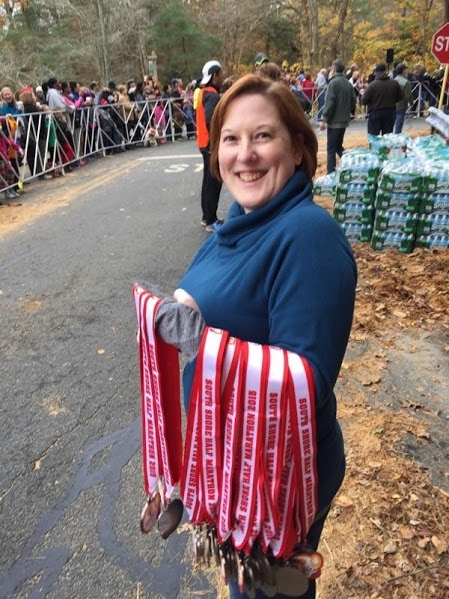 This entry was posted in Uncategorized and tagged half marathon, new england, running, south shore half marathon, volunteering. Bookmark the permalink. Isn’t volunteering inspiring?! Seriously, kudos to you for getting out there and helping out. The medals, in my opinion, are a symbol of a job well done or of just getting it done, any means possible. I look forward to your journey over the next year and I’ll be cheering you on every step of the way! Yes we can. And we WILL. All we have to do is stick to the plan and keep each other motivated and on track. Word. I gotchu, boo. Cheering you on forever! And if I can make it there to cheer you on, I absolutely will. GO BEC GO. You can totally do this! 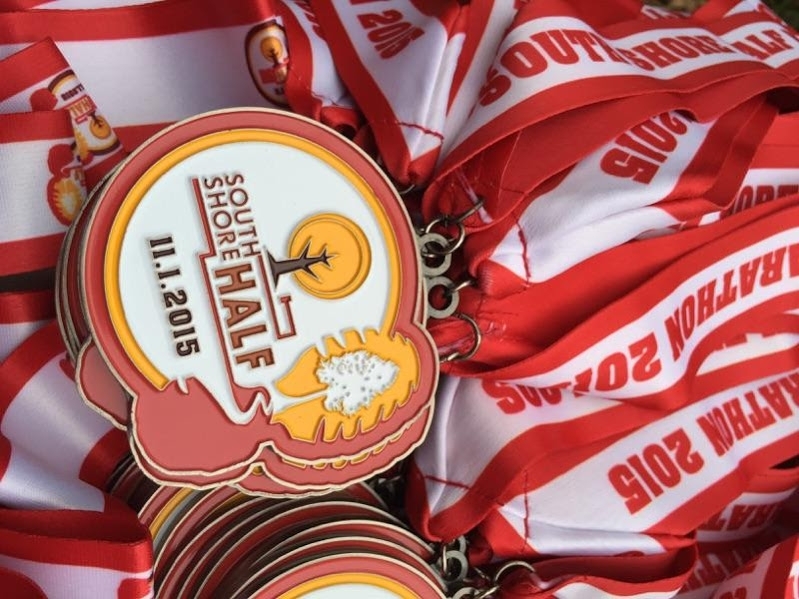 Half marathons are so much fun…you don’t even have to run then entire way. I love that you did this AND that it rekindled your desire to run!!! !